- Publisher An interactive workbook to help women realize their gifts and use them effectively. God has made you as a woman with your uniqueness to fulfill a special place of service in His Kingdom. Women Gifted for Ministry is designed specifically to help women discover and put into practice their own spiritual gifts. The spiritual gifts questionnaire provided in this book will help you determine your main spiritual gift (or gifts) and learn how to better serve God. Each chapter also includes Practical Takeaways, a Three-Step Bible Study, a prayer guide, and steps to personal journaling and meditation. You'll even find a list of things to watch for in young girls that suggest which gifts they may have. 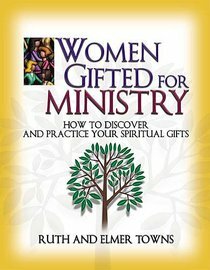 Women Gifted for Ministry is ideal for individual or small group study. This workbook offers a fresh look at spiritual gifts and a unique perspective on how women apply their gifts differently from men. About "Women Gifted For Ministry"
An interactive workbook to help women realize their gifts and use them effectively. Elmer L. Towns (D.Min., Fuller Theological Seminary) is co-founder of Liberty University, with Jerry Falwell, in 1971, and was the only full-time teacher in the first year of Liberty's existence. Today, the University has over 11,400 students on campus with 39,000 in the Distance Learning Program (now Liberty University Online), and he is the Dean of the School of Religion. Towns has published over a hundred books including My Father's Names; 10 Sunday Schools That Dared to Change; 10 of Today's Most Innovative Churches; Towns' Sunday School Encyclopedia and the Gold Medallion Award awarded by the Christian Booksellers Association for writing the Book of the Year, The Names of the Holy Spirit. The multi-volume Praying through..... series has been received by a wide readership. Ruth serves as director of counseling at the Family Life Services.